For this purpose, I wish to avoid brands and discussions on operating systems. 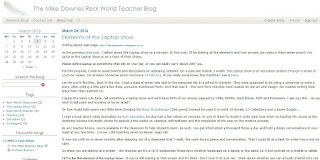 On a post last month, I wrote: the Laptop show is an education system through a series of youtube videos, not endless nonsense about hardware 13 Feb 16). If you really must know, the machine I use is here. Let me put it like this.. Back in the day, I had a class of seven year olds in the computer lab in a school in Warwick. They were supposed to be using a computer to write a story. After writing a title and a few lines, someone mentioned fonts. And that was it - the next forty minutes were wasted on clip art and design. No creative writing took place from that moment on. I apply the same rule here, call something a laptop show and we'll have 99% of our energy zapped by USBs, HDMIs, Hard Drives, RAM and Processors. I ask you this - do you wish to sell paint and brushes or be an artist? Or how Roald Dahl spent very little time choosing his Dixon Ticonderoga 1388 pencil, instead he used it to write 19 Novels, 13 Collections and a dozen Scripts .. I read a book about video journalism by Kurt Lancaster, he also had a few videos on youtube. In one of them he made it quite clear how when he teaches his course at the Northern Arizona University where he spends a few weeks on cameras, edit software and the remainder of the year on the creative process. As any teacher knows, you're available in the classroom to help students learn. As such, you get interrupted a thousand times a day and hold a dozen conversations in your head at any one time - I know I did teaching seven to eleven years old. It was not until six or seven months after stepping out of a classroom that I really, like really found peace and concentration. That I could sit at a desk for a few hours and be calm. So there you are staring at a screen - the chances are it's a 16:9 widescreen these days whether landscape on a laptop or the same 16:9 but portrait on a mobile or tablet. 16:9 is the first element of the Laptop show - if you're still staring at that screen and it's black. Don't turn it on just yet - think about whether you can actually predict why you are going to power it up. I think this is the essence of why anyone can make a Laptop show as each and every one of us are unique and we all used our machines in a very intimate and specialised way. And that's why my Laptop show will be very different than yours. And why most importantly we can learn from each other. When I press the power button, I'm met with a 15.6 inch screen that's 16 parts wide and 9 parts high (see the history of 16:9 wiki, where Since 2009 it has become the most common aspect ratio for televisions and computer monitors). On that screen: I read from it, write to it, create stuff like videos, make collages with screen shots, watch TV Shows or Movies and all for about sixteen hours a day. I bet you do too. As I've already said, I wish to create a set of videos and as Youtube uses the 16:9 ratio too - that's my format. I've always liked playing around with geometry, so I thought.. 16 x 9 = 144. What does that mean? As I have over 650 videos at YouTube and have made a video series before - I have a fair idea of what I feel comfortable with. So what if each square on that 144 board was one short video? What if 144 was converted to seconds and what if each one of those 144 videos was 2 minutes and 24 seconds long? I could make 144 videos x 144 seconds = 20,736 seconds = 345.6 minutes = 5.76 hours. I like it. It's worth throwing in here, how from my youtube analytics how my personal Audience Retention, Average Duration per video is 80 seconds. And how my most popular video is 2 mins 12 sec in length with a Audience Retention of 63%. It's vital than any youtube creator understands this. I have many posts and here's the Index Page. In other words, make punchy short videos that help people learn while youtube will supply you with enough data as feedback for you to instantly recraft each video. As a classroom teacher I did not have that. I would teach andlook at the class - I had no clue who was paying attention. Of course many students these days are tracked by quite advanced intelligent learning environments. Getting back to the 144 idea, I started to imagine a pseudo Periodic Table overlaid as set of elements, all part of a design process. I also coloured and numbered some squares, with no real order or purpose. However, in the back of my mind, I knew I would make videos on Sony Vegas or OBS etc.. and they would be a mini series in themselves. I'm not going to claim this is easy, but if you can see ahead a few videos at a time, then it will help. My method will be about How I use my laptop and How I do what I do and Why I do it that way. Of course that will open up discussion and already I've had people be honest with me. In they are brave enough to admit they have no clue at all how to use it, albeit check email, visit a few websites and watch videos, oh and check facebook or twitter. To end the section on 144 - look a little deeper and it's a fantastic number. It's 12 x12 and has 15 factors. Be yourself and use what works. If you know you will never, like in a million years make 144 videos, then don't. Use 16 x 9 and make maybe 16 or 9 videos - or 16 + 9 = 25 videos. I feel confident to make 144 videos in Series One, following the pattern 'Title, the Laptop show 1/144' meaning video 1 of 144. You can see from my overall public design how the 16:9 incorporates a faint square grid - that not only looks clean and crisp, but reminds me of the squared maths paper we always had in a drawer in the classroom. What I need is a constant reminder that any one video fits into a much larger mosaic of learning where everything is interweaved and connected. est. 1984 - There are a few parts to why this matters. I class myself as a real world teacher. Tracking it back in my memory, it was in 1984 when it started. I was studying Photography at school. I helped people and had a natural instinct to teach (of course not realising it at the time). But, I do remember being called Profas a nickname. It's not until many years later, this stuff begins to make sense. There I was alone in the Black and White Darkroom, under the red lights and listening to the radio. Steve Wright had his morning show and I remember it like yesterday. It was the morning of 2 April 1984, when Marvin Gaye died. From my own timeline, 1984 was ten years before I started my Degree at Warwick (in 1994). And now in 2016, it's another twenty two years on. The Laptop show is not about tech at all, it's about the passage of time, learning and reflecting on the life we have lived. Where any screen we see and use should mirror real life merge with our thoughts and desire to be understood and to create. And no more so than the word laptop itself. According to a few dictionaries. Word Origin and History for laptop: also lap-top, as a type of portable computer, 1984, from lap (n.) + top (1),on model of desktop (ref). There's an image of the Dulmont Magnum too. If this project is going to be a success for me and success for the learner spread across the planet then there needs to be a high level of motive to drive me. It's about purity and doing things that are in your nature. This is what carries a heavy mass rolling toward a satisfactory conclusion. When you have got this far, it will not hurt to placemark some tangible areas. 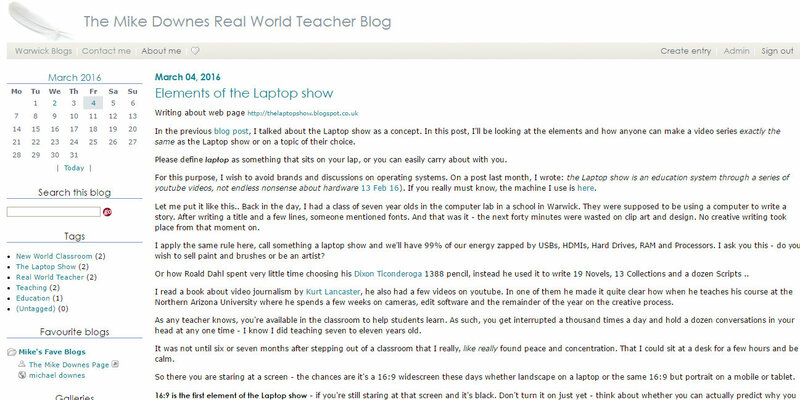 This maybe a dedicated blog, sauch as: thelaptopshow.blogspot.co.uk. Notice how I believe it more valuable to keep the native URL identifying blogspot and therefore blogger, than I do hiding it. This shows the world what I use and will help then to do the same. I don't really believe there's any value anymore in domain URLs and neither do google - they [google] want a site to be found by the user knowing what words to use in search, not the fact that a user knows the website name of it. A hashtag maybe nice, I use #theLaptopshow .. I cannot believe I seem to be the only person using this tag. Having a decent email can be useful, having a gmail in my opinion is even better. So I've opened askthelaptopshow@gmail.com.. A Gmail and therefore a Google account is like the solid trunk of the Google Tree. There are literally a 100 benefits with that one Gmail address (I will cover that topic in a video). A word about YouTube Channels - I'v decided not to create a new channel just for the laptop show. This is because I have a channel under my name as youtube.com/mikedownes already established. I do have a few other channels, but none that I would class as frequently used, so I just stick to the one. Summing Up - the Laptop show is a series of educational videos about using a laptop. Season One will be 144 videos, each about two to three minutes in length. They will be uploaded to YouTube and backed up by this blog, my media blog and a few dedicated areas (like blogspot, google+, twitter etc). Each video will be 'title, the Laptop show x/144' (where x = video number 1-144). I encourage you to do the same, if not better than me, either as another Latop show or a topic of your choice. It could be the Archery show or the Cooking show or the Mobile show - really up to you. The world is a big place and a billion is a big number for us all to get views and help people learn. A word about Inaara - If I had an ideal person to teach, it would be Inaara from Tanzania (blog post ref). I've taken part in many Google tests - one was on twitter where we [testers] got flagged for questions about google services. inaara tweeted, I replied and helped and we were not known to teach other, yet connected five thousand miles apart in realtime. My ideal audience would be someone who has desire, not ability to learn. Someone who has an open mind and curiousity to find an answer to their questions. In the next post, I'll tell you all I know about one video called: How to clean audio with Audacity: Noise Removal, Normalise and Compressor - it's had 45,000 views and has been watched in 187 countries. I took me two minutes to make it and I did it as a test. 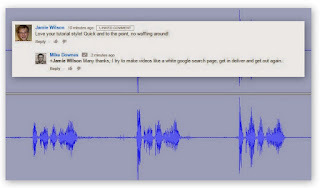 It's a pretty awfully bad produced video that does not even fit the screen properly, but it solves a simple problem that people face day in day out - to correct badly recorded audio.